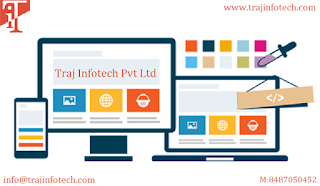 Traj Infotech: Need to know the right time to redesign your website. Need to know the right time to redesign your website. Most companies want to know, when the right time to redesign their business website is. Before redesigning your website, there are a few things that one needs to consider. Website should reflect the current company’s products. Whatever said and done your website should reflect the company’s current brand and identity. If the company plans to make changes, the website should run in similar lines along with the current changes. Website failing to do so, can decrease the number of website visitors because they’re confused whether the website is right or not, definitely time for an instant website redesign. Traj Infotech, Best IT Services in Ahmedabad, can help your website with the current changes. With growing competition, websites may have to be redesigned more often to able to attract the attention of target customers and also build loyalty. Longer gap means you need be aware of the latest changes with search engine optimization and technology. If the website wants to continue to be competitive online, the best solution is a slight change, nothing drastic. Traj Infotech, Best SEO Company in Ahmedabad, can create an appealing website for your business. Website and browser usage should be compatible. To know what are the browser users use presently to browse the web, you need to check the browser statistics. The web browsers need to be regularly updated to remain with the present modern technology and to address any kind of latest security threats. The latest browsers are constantly developed and also adopted by the users. Websites that do not function properly on these latest browsers could affect the user experience and also force users to leave the website beforehand. IT Company will ensure your website is modern with a positive user experience. The search engines are continuously tuning the algorithms that act as the backbone. All these changes will have an impact on the appearance of your website on search engine results. To remain on the top of the list, you need to be compatible with the present changes. IT Services will carefully review your website and determine website redesign that is needed.